Meghan Tepas is a Partner in the Litigation Practice Group. Meghan focuses on Complex Commercial Litigation and she has extensive experience representing businesses of all sizes in various contractual disputes, including those involving employment, shareholder and leasing agreements. Meghan has drafted numerous successful dispositive motions, including a motion to dismiss for lack of personal jurisdiction on behalf of a trucking company defendant and a motion to dismiss federal Lanham Act claims on behalf of a national alarm services company. 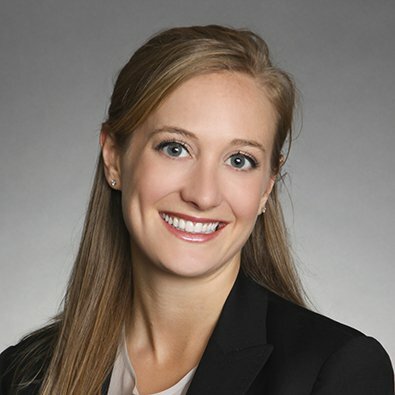 Meghan served as second-chair counsel during a three-day evidentiary hearing in the Eastern District of Pennsylvania Bankruptcy Court, after which the court dismissed the case against her client. Successfully defeated multiple motions to dismiss filed against her client in a multi-million dollar breach of trustee action against a regional corporate trustee. Successfully defended financial institution client against breach of contract lawsuit resulting in dismissal of both the complaint and the appeal. Successfully pursued and collected monetary judgment on behalf of pro-bono client. Represented client in five-day private mediation in a contentious breach of fiduciary duty case and secured favorable settlement. Defended national residential alarm services company in multiple Lanham Act lawsuits involving allegations of unfair competition and false advertising brought by competitor in Federal Court for the Southern District of Florida. Author, "Curtailing The Tail of Liability for Dissolved Corporations," Civil Litigation Flashpoints, published by the Illinois Institute for Continuing Legal Education, June 2014. Author, "What’s in a Name?" Civil Litigation Flashpoints, published by the Illinois Institute for Continuing Legal Education, February 2013. Author, "A Look at Traditional Islam’s General Discord with a Permanent System of Global Cooperation," Indiana Journal of Global Legal Studies, 2009. Freeborn & Peters LLP is pleased to announce the firm has elected William E. Russell as its new Co-Managing Partner. In addition, the firm elevated attorneys Jason P. Stearns, Robert A. Stines, Meghan E. Tepas and Julian C. Wierenga to Income Partner, effective Jan. 1. Meghan E. Tepas and Joseph H. Donegan represent Freeborn Food Industry Team Client Grand Central Brewing, which is featured in the article “One of the city's largest breweries won't be making beer of its own,” published Sept. 9, 2016, by Crain’s Chicago Business.